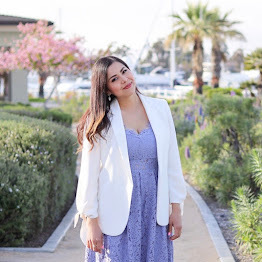 Ever since I had Julian and my return to being a consistent blogger, I have made it a goal to attend blogger or brand networking events, to establish and/or maintain those connections. Let's start with the main reason why I made going to blogging-related events a goal of mine. Since I am working a full time job that is the opposite of blogging these types of events allow me to stay connected to other creatives. By connecting with fellow influencers not only am I making new friends but also able to have those blogging-related conversations that other non-influencers friends and family wouldn't understand. For example, I can't really talk to my husband about the Instagram algorithm, he would probably roll his eyes and change the subject! Plus, there is a certain energy in the air when I'm around like-minded creatives. Once you establish great relationships with other bloggers, you'll notice what a great resource you can be for each other- you can share advice, tips, use each other as a sounding board... community over competition! I also feel like you never know who you are going to meet at these events, whether it be new blogging friends or brands! So many of my local brand opportunities have come from meeting a brand representatives or a person from their PR team at these types of events. Obviously you have to put your best networking skills at the forefront when chatting with them, give them your business card and/or Instagram handle so that they can scope you out when they go home and if you are a good fit they'll have you top of mind when an opportunity presents itself. It also allows them to put a face and personality to a blog which is so needed in an age where we pretty much live on our phones. A another totally different reason for me is that these types of events snap me out of mommy mode and gets me out of the house for a couple of hours. I am so thankful for my husband's support in allowing me to escape a couple of hours to go to these events. I have been getting the "I don't know how you do it all" question and my response to that typically is "I don't know how I do it all either" (and between you and I, I am not doing it "all"), but I think it has a lot to do with the support of my husband and family and my passion for what I do here on lilbitsofchic.com. I know many of you mommies are probably wondering where the mom guilt is, trust me it's there, but since these outings are my only real "me time" I get in the week, I think it's important for my sanity and fulfillment. 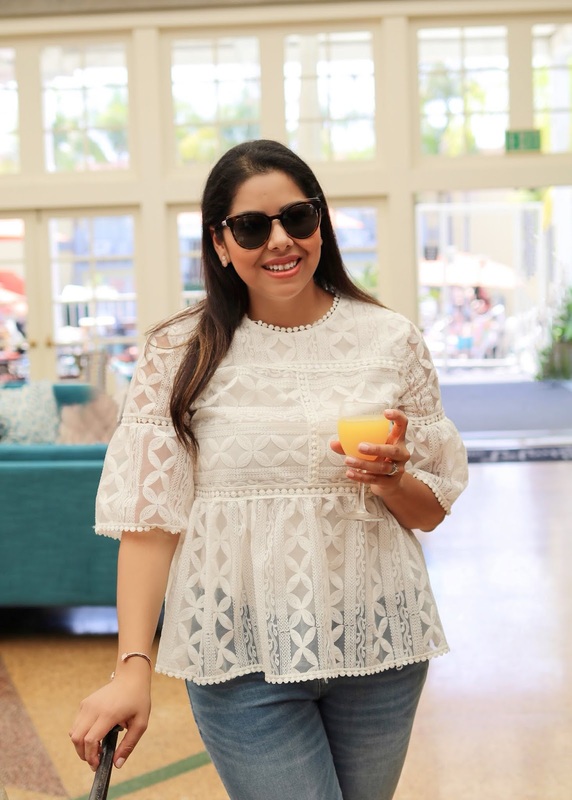 Because of said reasons, I have been accepting invitations to blogging-related events on an almost weekly basis and this past weekend's event was c/o L.A Mamacitas, a network of go-getters, influencers and mommies based out of Los Angeles who took their fab networking event on the road and made a stop here in San Diego! 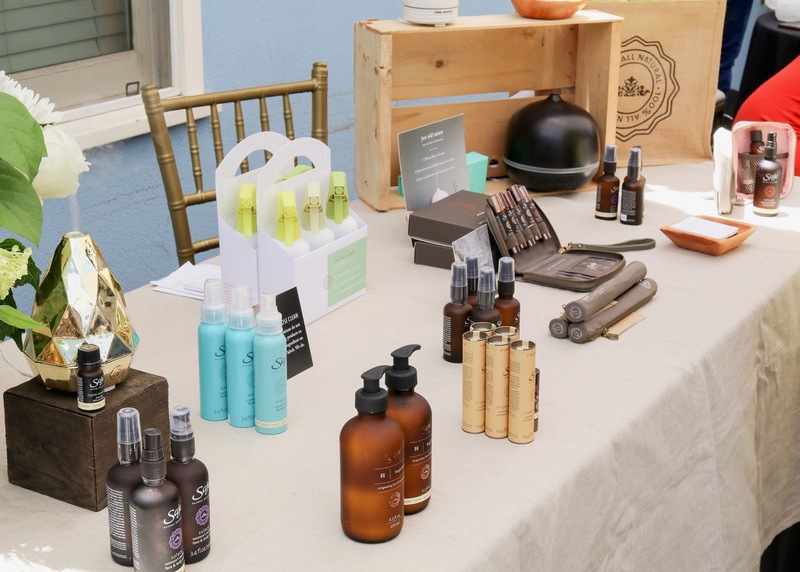 The event was held at The Lafayette Hotel (which might I add has so many instagrammable nooks and crannies that I'll need to come back to) and in one of those sections L.A Mamacitas set up a beautiful spread of vendors and cute backdrops. These vendors' missions was to pamper us, and pamper us they did! Think lash bar, massage station, motivating woodwork and tees and so much more. 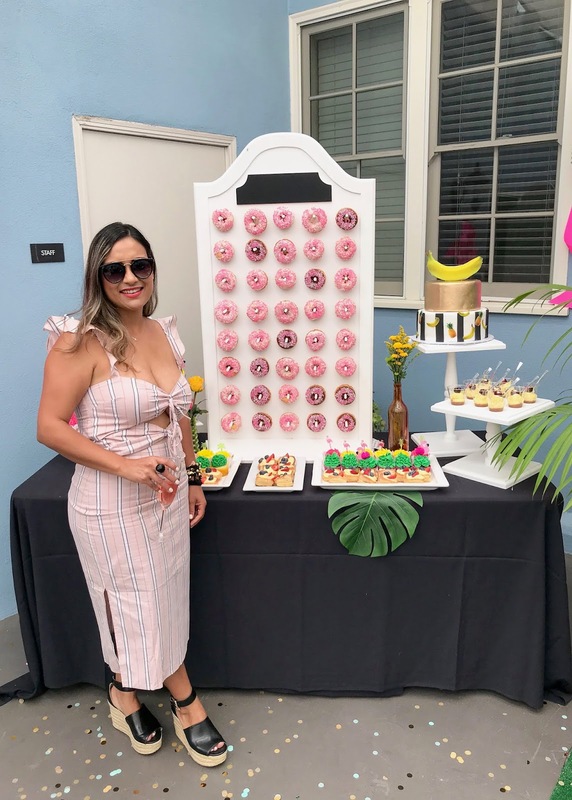 For this event, I went with my sister's best friend (and my good friend) Maria from MKR Creations, she's the one that created and styled baby shower dessert spread and also a fellow mompreneur! Both of us definitely needed that pamper girl time! The weather was hot and ideally I wish I would have worn a summer dress, but since I had already planned to wear what I'm wearing (thinking it wasn't going to be as hot as it was) and I was in a hurry I didn't have time to change up my look. Either way I love this top from Chicwish, especially paired with jeans because the top is such a statement piece that I just wanted it to be the focal piece. 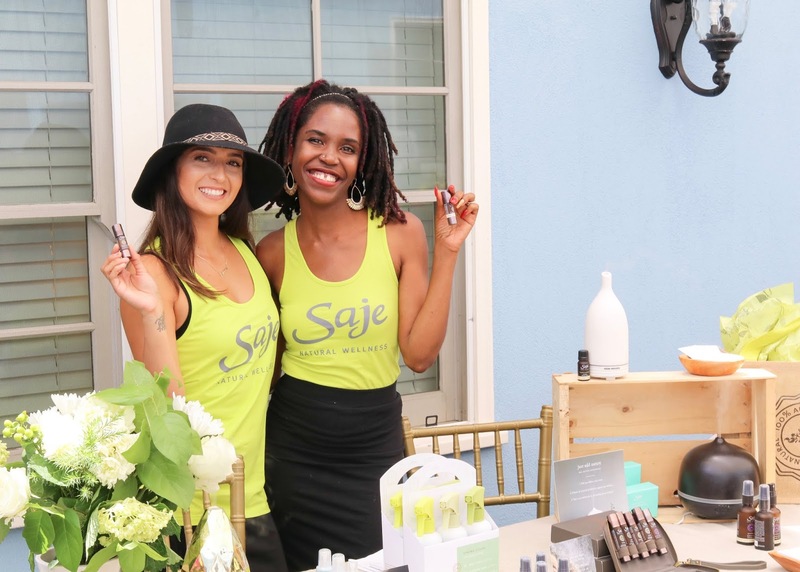 One of the vendors we checked out was Saje Natural Wellness San Diego that aim to replace medicines and other products with natural products! 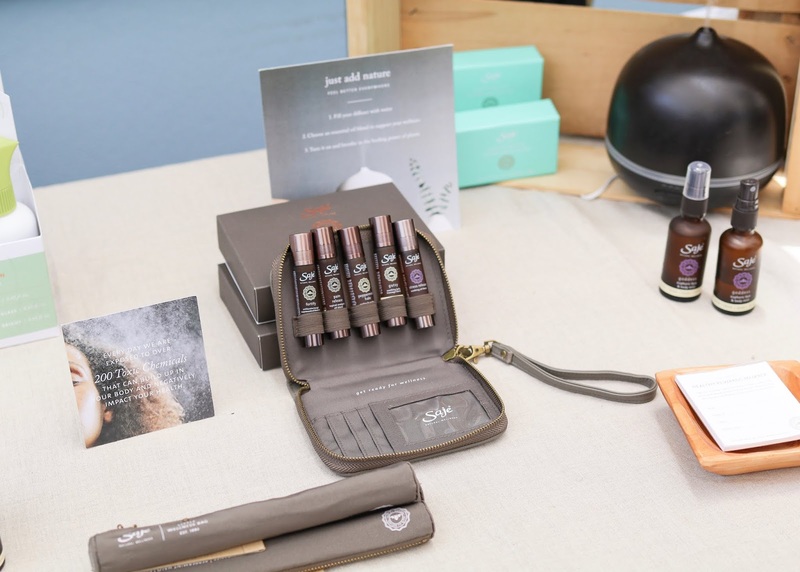 Saje gave me a sample of one of their most popular products and what the brand was founded on, Peppermint Halo® a cooling & soothing oil blend and explained that is good for muscle tension and headaches if applied. I got a sample applied on my shoulders and I felt like an icy hot tingle with a nice smell. They also have other essential oil blends for different needs such stress release, pain release and more. 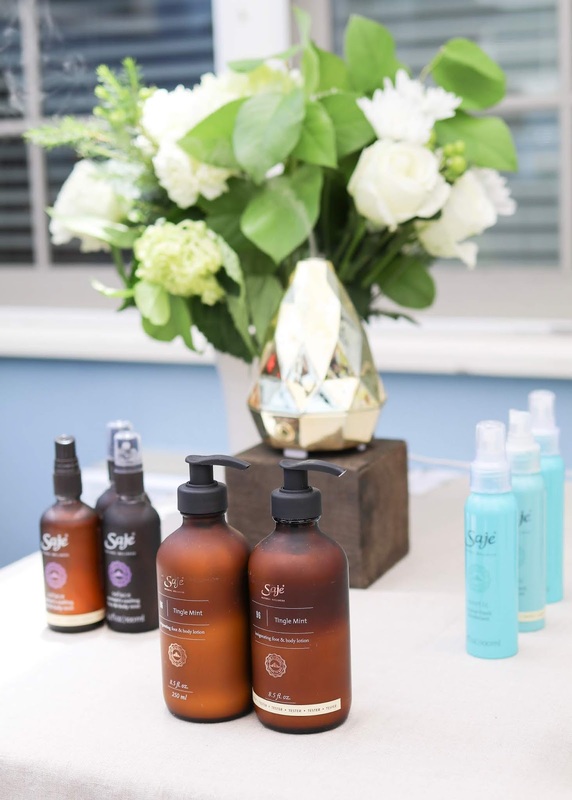 They also have diffusers and even natural cleaning products! If you are in San Diego they have a location in Westfield UTC and one in Fashion Valley! 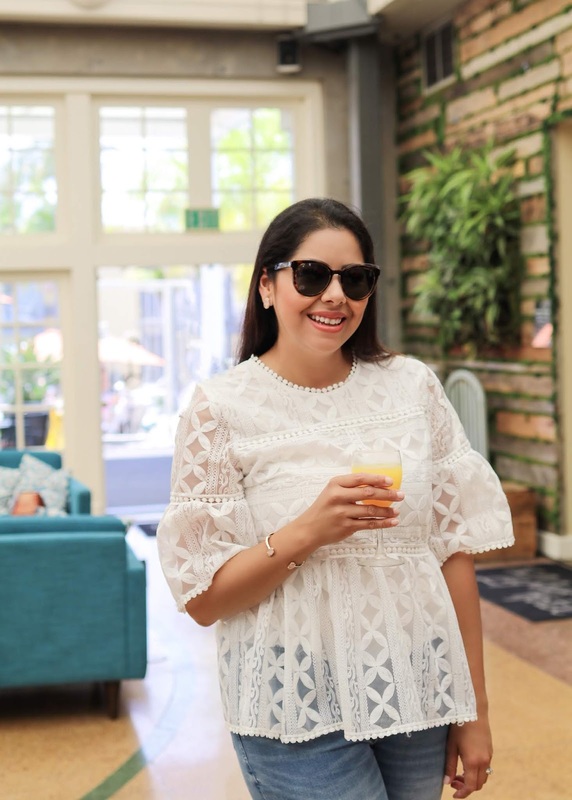 After getting my pamper on, it was time to head back home to return to mommy-world, so I savored my last drop of mimosa, took a couple more pictures and thanked L.A Mamacitas for a great event! Make sure you follow them or check out their website for their future events, I could tell that these ladies put their heart and hard work into making this event a success. Hope you enjoyed today's blog post! I would love to hear if you are a blogger and what you think about blogging events and its benefits! This is a sponsored conversation written by me in collaboration with L.A Mamacitas. The opinions and text are my own. There's not many blogger groups in my area. I've always been interested in a meetup/events. The only person I know that lives kind of close is about an hour-ish away and she only posts about her cats.